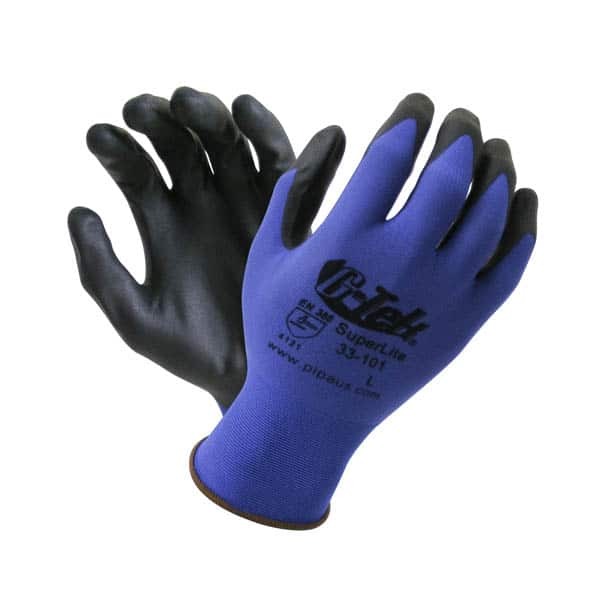 G-Tek SuperLite’s introduce an ultra fine glove material into the P.I.P family of exceptional fit and feel gloves. New comfort blend seamless knit 18 gauge nylon liner coated in ultra thin PPU for precise work. New Technology PPU Coating provides superior skin contact comfort compared to standard PU Coating. Touch screen compatible (Tablet, Smartphone etc). No need to remove your gloves to answer your phone. Seamless knit super fine liner for maximum sense of touch. Ultra pliable PPU coated palm and fingers for exceptional tactile sensitivity. Maximum UV Protection from Indigo Blue colour liner. Seamless Nylon liner ( 18 guage) with PPU coating on palm and fingers. Indigo Blue with black. Sizes S – XXL. 12 pair per Pack, 144 pair per Carton.